There are some professional Institutes in the USA which offer professional and certificate courses in Accounting, Auditing, Finance and Taxation, and have members in various countries of the world. These courses have global recognition but the scope of work in India may be limited to in jobs with multi-national organizations like PricewaterhouseCoopers, Ernst & Young, KPMG and Deloitte. Some preliminary detail on a few such courses is given below. 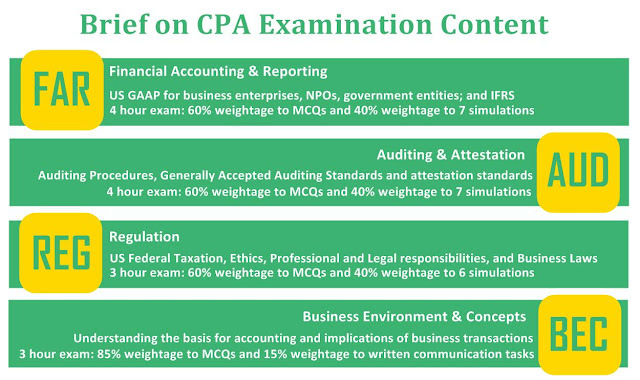 CPA stands for Certified Public Accountant, and refers to a trusted financial advisor who helps individuals, businesses, and other organizations plan and reach their financial goals. It is the highest accounting credential in the United States, and its exams are conducted by the American Institute of CPAs (AICPA). The CPA license is issued by one of the 55 states or territories of the United States all of which are members of NASBA (National Association of the State Boards of Accountancy). The Institute of Internal Auditors, India is affiliated to its parent body IIA, Inc in Florida, USA, which was established in 1941. Throughout the world, The IIA is recognized as the internal audit profession's leader in certification, education, research, and technical guidance. IIA, Inc also conducts several certification programs which can be taken at any of their six chapter locations in India. IIA India works together with the IIA, Global in providing Internal Auditing Practitioners, Executive Management and Board of Directors with standards, guidance and information on best practices in Internal Auditing. 1. Certified Internal Auditor (CIA): The CIA designation is the only globally accepted certification for internal auditors. 2. Certified Government Auditing Professional (CGAP): The CGAP certification program is designed especially for auditors working in the public sector at all levels — federal/national, state/provincial, local, quasi-governmental, or crown authority. 3. Certified Financial Services Auditor (CFSA): The CFSA is a valued specialty certification for audit professionals working in banking institutions, thrift/savings and loan organizations, credit unions, insurance companies, security and commodity services, holding and investment companies, credit agencies, financial services regulatory agencies, and other financial services organizations. 4. Certification in Control Self-Assessment (CCSA): The CCSA exam tests your understanding of important CSA fundamentals, processes, and related topics such as risk, controls, and business objectives. All details about course registration, exam structure and exam content can be viewed here. In case you have any other questions, you can go through the FAQs here. Click here to visit the website of the Institute of Internal Auditors.